There are some pretty amazing fares available from Calgary that allow you to visit both Hong Kong AND Shanghai, China for just $590 CAD roundtrip including taxes. $590 roundtrip to either destination on it's own would be an amazing price. The flights involve using a combination of Air Canada and Cathay Pacific or China Eastern Airlines. 2. Click on 'Multiple City' to start your search. For longer trips (using either Expedia or FlightHub) - you can try mixing and matching the departure and return dates from the examples above. calgary, yyc, flight deals, air canada, asia, east asia, hong kong, hkg, china, shanghai, pvg, china eastern airlines and cathay pacific. 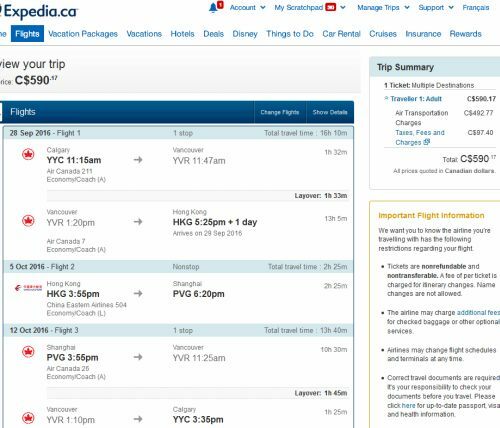 6 Responses to "2 in 1 trip: Calgary to Hong Kong AND Shanghai, China - $590 CAD roundtrip including taxes"
Dates must match what's shown above. Departing on a Wed and returning on a Wed.
Do any dates in the spring work? Prices are now at $1083. I booked this on flight hub sept 28 - oct 12 for 587! THANKS!